Truthfully, I wasn't altogether certain that I wanted to read The Extraordinary Education of Nicholas Benedict which is a prequel to my beloved Mysterious Benedict Society books. Why? Because I really, really, really like The Mysterious Benedict Society. A lot. Whenever an author (or anyone) tries to capitalize on past successes, they frequently fail. "Tack-on" books to popular series frequently disappoint to the point where I really don't make a effort to read them. But this. This is Trenton Lee Stewart. And this is The Mysterious Benedict Society! I could not think that he wouldn't give the book his all and make it a worthwhile and very fun read, in keeping with the reset of the series. He did not disappoint. I really, really, really liked The Extraordinary Education of Nicholas Benedict but for different reasons that I enjoyed the rest of the series. Anyone familiar with the original series will be interested to know who and what made Nicholas Benedict into the man he became. Taking care not to offer spoilers here, we meet young Nicholas (age 9) on this way to his placement in a new orphanage called Rothschild's End. (Or, 'Child's End.) It isn't the most ideal living situation but the fire which fuels his hope for a better tomorrow is the knowledge that there is a treasure hidden somewhere on the property. Nicholas intends to find it. As regulars around here know, I am rather fond of The Mysterious Benedict Society books in part because I can see and draw spiritual parallels and applications from the stories. They are clever and fun but are also packed with truths which can be applied to the Christian life. (I'll reiterate the fact that I have never heard or seen Stewart claim to be a Christian, but that does not disqualify him from writing and sharing truths. I've argued all of this before here and here.) The Extraordinary Education of Nicholas Benedict didn't effect me in the same way. There were small nuggets of truth and insight scattered about but nothing as hugely impacting (to me) as in the first book. Instead, this new story read off as mere entertainment. I was entertained. I found this story to be pleasantly diverting, but not deeply impacting. That is not to suggest disappointment in the story in any way (I devoured it) but just that it isn't as meaningful a book to me. It is still a great deal of fun. I've seen people questioning whether or not you could read this new release first, or if you should start with the actual Mysterious Benedict Society books. I think it's perfectly fine to read this one first. Then again, if I wanted someone to thoroughly enjoy the series then I'd probably tell them to read this one last. Perhaps its curiosity is in the fact that I'm already familiar with Nicholas Benedict and am just looking for more background information. I also can't tell but that Stewart left open the possibility of writing more about Nicholas in the future. The closing pages indicate that the reader shouldn't be terribly surprised to see another book out by Stewart on this subject. For my part, I hope he doesn't write anymore about the Society. In part, I dread that another Nicholas Benedict book wouldn't be as engaging. I'm also not convinced that releasing another story wouldn't kill the magic that is Book 1 in particular. The above is all just my opinion (although tightly held.) Would you like a chance to read this for yourself and see what you think? 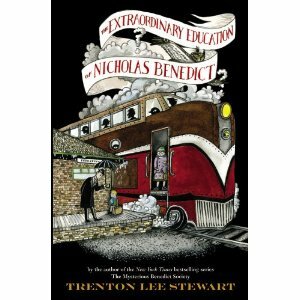 Little, Brown Books has offered me THREE copies of The Extraordinary Education of Nicholas Benedict to give away to three of you! This contest will be open through this week and will close on Friday, April 20th. Must be a U.S. Resident to enter. THIS CONTEST IS NOW CLOSED. THE WINNER'S (selected by Random.org) are #5 - Bluerose, #9 - Sky and #14 - Beth! Congrats ladies! 1. I'd like to take a brief moment to point out that you can purchase the Mysterious Benedict Society Collection for $14.28 on Amazon. That is a ridiculously good price for a fantastic series. Of course! Sign me up!! You had me chuckling in agreement from the first paragraph. If you say it's worth reading. . .well, then, OK! Sign me up (let's hope my bizarre luck holds, giggle). I read the series at your recommendation in the first place and had a blast with my big kids, so let the fun continue! I LOVED the Mysterious Benedict Society. I'd enjoy a change to read this one. I can't wait to hear 'how it all began!' Thank you so much for offering this giveaway. Yes, please!! I've only read the first book but would like the read the others. I found a copy of the first book at the used book sale a last month. At .25 cents I snatched it up with a greedy little chuckle!! Oh I would LOVE to win this! I loved the original series! I would love to win this to give to my daughter. This series of book is her favorite books! OH yes, I would love this one! I'm wondering if my 8-year-old voracious reader is ready for this series... I'd love to win this prequel! Lovedthe series and am glad to hear this one is good too! My sisters and I loved this series and really look forward to reading this one together. Thanks for your review. I think this book (and this series) would be just perfect for my young cousin. (And I want to read it too!) Please enter me in your giveaway. OH HOW I LOVE THIS SERIES! I am so excited that you gave this book a thumbs up. My kids and I love this series. I wasn't sure about a prequel, for the same reasons you stated, but they were excited to hear a new book was out. I'm glad to hear it's a good one. I'd love to enter your giveaway. Thanks for the chance to win! Just finished this one tonight, and thoroughly enjoyed it! I hate for it to end.